Over time, your vinyl fence may begin to build up dirt, mold and grime on it, diminishing the nice, clean look it had when installed. Vinyl fencing is surprisingly easy to clean and with proper maintenance your vinyl fence will last for decades. Working from the top down with your garden hose, and a soft brush if needed, wash off loose debris. Using a mild cleaner (see list below) and a wet sponge, apply the cleaning solution and let it sit for a few minutes. Wipe the surface firmly with the sponge and rinse with your garden hose. Wipe with a dry cloth if desired. For heavy dirt build-up, you may wish to use a pressure washer. In general, vinyl materials are safe to be pressure washed, but must be done with care, as too much pressure in the wrong area can permanently damage the fence. Always follow manufacturer’s use and safety instructions of the equipment. When planning to pressure wash your fence, take caution to either secure or remove post and picket caps and/or accessories that may detach under water pressure and be damaged. 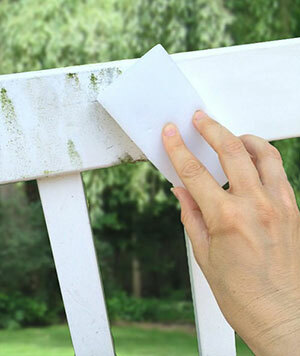 Spray a soap solution on the fence beginning at the bottom and working up towards the top with low pressure. Working in small areas will ensure that the soap will not dry on the fence before you are able to rinse. Apply the solution evenly and let it sit for a few minutes. Begin rinsing at the top and work your way down with higher pressure. You may need to scrub stubborn areas prior to rinsing with a soft bristle scrub brush or a Mr. Clean Magic Eraser. Always begin rinsing at a safe distance from the vinyl ensuring no damage can be done. As you begin rinsing, move closer to the fence until you can effectively clean and rinse it without damage. Too much concentrated pressure can permanently damage the fence. Thoroughly rinse the fence removing any soap residue. Wipe with a dry cloth if desired. Cleaning your vinyl fence with at least once a year can prevent dirt from building up and help keep your fence looking like new. In some cases you may wish to use mildly abrasive cleaner, such as cleansers or a paste-like scrubbing solution. Use of abrasive material could have a negative effect on the surface of the fence. Do not use cleaners containing aggressive organic solvents because they could affect the surface appearance of the vinyl. Examples of such cleaners are: chlorine bleach, liquid grease remover, strong soaps, and detergents containing organic solvents, nail polish remover, and furniture polish/cleaners. Always follow manufacturers instructions when using any type of PVC revitalizer products. Failure to follow manufacturer instructions may result in irreversible damage to the vinyl materials.